Captain Craig went into business for himself in June of 1984, which means he has been a fishing guide in Key West for over 20 years and is still going strong! In this time he has worked with stellar crews and has had some of the best first and second mates in the area. The Grand Slam was Captain Craig's first boat back in the 1980's. Today, Captain Craig is on his third boat, The Ultra Grand Slam. Captain Craig continually upgrades his boats and equipment to ensure the best and most productive charter available to people looking for fishing options in Key West. 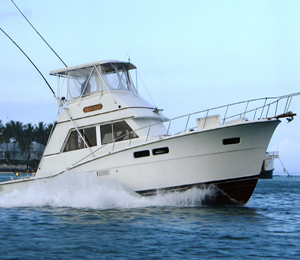 Professionalism is the name of the game on the Ultra Grand Slam Key West fishing charters. Captain Craig and his first mate are both highly experienced. In fact, putting them together will give you 43 years of experience in Key West waters, alone. This total does not include the fishing and charter experience gained in other waters or parts of the country. This is definitely one of the most experienced crews around and you will soon see how well they handle things with their own blend of team work. While Captain Craig leads you to your fishing destination, the first mate will ensure that you are ready to go once you arrive there. All equipment will be checked and everything will be ready to go when the time comes to begin fishing. You will have a chance to work with the first mate as he helps you bait hooks and catch the fish Key West has to offer. Of course, if you do not want this type of help he will be more than willing to sit back and let you enjoy your trip by doing the work on your own. Captain Craig and his first mate do the best they can to provide a warm, welcoming, and entertaining atmosphere. You are welcome at any time and they strive to make sure that you know that they love to have you around. After all, fishing is more fun with good friends around. Captain Craig does his best to be able to provide as much of the trip as he can for you. This allows inexperienced people to just show up and not have to worry about the needs for licenses, equipment, or anything else. With this in mind, it should comes as no surprise that if you are interested in mounting any of your catch then Captain Craig can help you do this. As a representative of Gray Taxidermy, he can handle your mounting needs without any hassles. When it comes to fishing, Captain Craig is able to offer you the very best. Captain Craig prefers to use Penn International and Shimano tackle. All equipment is provided free of charge so there is no need to worry about picking up any equipment before your Key West fishing charter. I have been to the Bahamas many times, but Ultra Grand Slam is one of my favorite trips! It includes everything that everyone should do here. As a Bahamas veteran, I can say only the best about this experience!